Our improved version of the Finnish military issue M05 summer woodland jacket. Our enhanced version features two zippered sleeve pockets and better adjustable cuffs. Looks just like the issue jacket at first glance, but functions a little bit better. Officially M05 RES approved! Assorted sizes are sold off at a reduced price due to a renewed sizing system! In comparison with the Finnish military official issue M05 jacket we have improved the cuffs for better adjustment range and added two practical yet quite inconspicuous zippered sleeve pockets! 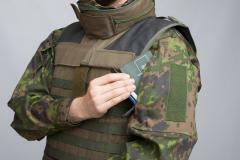 M05 RES is an official Finnish Defence Forces inspection and approval system for commercially produced military clothing. 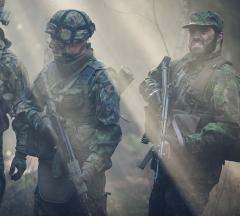 A garment that is M05 RES approved is officially approved for use in military military exercises and other fun activities that the FDF organizes. 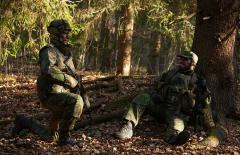 The M05 RES system is a small step in the right direction and a huge change in the general attitude of the Finnish military complex. Whereas ten years ago a simple non-issue dump pouch could get you in trouble we now have the possibility to create commercial clothing that can be officially approved for use. For us Finns this is a very, very welcome change and a good beginning to build on! The first number (6—9) of the three-digit size means length and the next two (44—60) stand for width in the European standard men's sizing. This is the official FDF standard. Preliminary out-of-the-box opinion. Not properly field tested! UpDated 24.01.2017. So I have had some time to correct my review. I really like this jacket, but I really do not like the zipper solution. This jacket is not comparable in workmanship to the Arktis line of jackets, but neither is the price tag. You will have to pay two times as much for the Arktis B210 and more than three times as muck for the Arktis B221. You could also get better quality for less money if you would be lucky enough to find the "right" surplus uniform, in near-pristine condition, and in your size. For your money, you get a reasonable priced, european produced jacket without all the unnecessary "whistles and bells" and with an acceptable quality. This jacket is made from single layer fabric which is M05 "summer" camo on one side and plain white on the other side. There are no lining and there are no special reinforcements on the elbow area or other places like the shoulder area. There is a piece of membrane on the inside over the elbow area and lower under arm for water proofing.The fabric appears to be of good quality (maybe excellent?) but I am no tailor and have only had this uniform for days not years. Take into account that I have not been washing my uniform as of yet. I am 175 cm and 85-90 kg with large thighs, standard to large chest, short legs and short arms. I will normally wear size M to L in jackets and size 34/30 in trousers. I have a size 750 jacket and size 750 trousers. The jacket is a nice fit for me. The trousers is a nice fit standing but seems to be a little too tight when squatting down. If you have large thighs you might consider to og up one size in width. Trousers in size 752 would propably have been a better fit for me. This uniform is available in a large array of sizes which of course is a trade off between fitment options and overall production costs and logistical costs. As mentioned this fabric is M05 "summer" camo on one side and white on the other side. This is not preferable, but not the end of the world either. I guess it keeps production costs down as the fix would be to have a more complex and thus more expensive dyeing process. 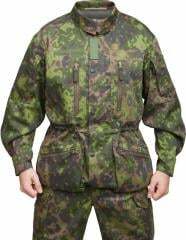 The positive side is that you could turn the inside out and use this uniform as a kind of winther camo, but only with internal pockets (irony). The negative side is obvious in a tactical environment. 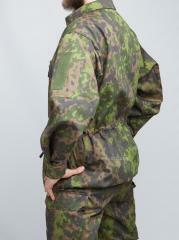 This is not a problem with the trousers (as no male enemies are supposed to see the inside of your trousers), might be a nuisance with the jacket (in camp) and is a nuiscance with the hood as the inside of the hood is clearly visible when the hood is resting flat against your upper back. You will thus have to make sure that the hood is always cinched up whenever it is not in use. This will make it more annoying to use the hood. But this is propably more of an annoyance than a real problem.So is this a deliberate feature or a cost saving solution? I do not know and I both kind of like it and dislike it. I would have preferred normal buttons (not nescessarily canadian style buttons) at the hip (cargo) pockets and the "light duty" zippers on the chest pockets. The "heavy duty" zippers used on the hip (cargo) pockets and on the chest pockets are not a great choice in my opinion. All theese four pocket zippers resist closing completely - they have a hard time going the last inch or so. You wil have to use both hands in order to close the pockets completely which is annoying. Might be fixable with some sort of grease though. The "light duty" zippers used at the upper arm pockets does not seem to have this problem. Zippers are noisy, might freeze up in winther and are hard to operate when placed horizontally - all of which is not a problem with buttons. I would have preferred some kind of dedicated reinforcement (cordura) at elbow/underarm area for durability and water proofing but there is a piece of membrane on the inside though over this area. I would have preferred larger hip (cargo) pockets. I would have preferred to have a vertical "space" or "dump pouch" behind the hip (cargo) pockets. Such a space would be great for hand warming and for immediate use (magazines, grenades) when not wearing belt gear. I would have preferred some kind of dedicated reinforcement at lower back area (lower 20 cm) for durability and water proofing. I would have preferred a large horizontal inner pocket at lower back for one pair of (flat) thick woolen socks. This will also keep your lower back warm. 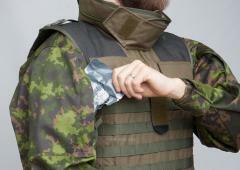 I am used to this feature from the danish M/84 jacket. Great quality again, be careful when ordering. If in doubt drop a size as postal returns from UK are expensive. Lots of pockets and very functional. Great woodland camo too. Very pleased. The cut is really loose, but this is ok since we have waist spring tensioner and wrist velcro, this can work well in winter with few layers under. The overall quality seems solid, the chest zipper can be difficult to close, but since you have the right move, no problem at all. Edit : Tested on field, this work perfectly, the loose cut allows almost every possible moves, perfect for my woodland airsoft combat use. Oikein juhlava Maasto-takki ja mitat jus, eikä melkein, suosittelen ostamaan.